Ok, I'm not IN a brown box. But, I am in love with a brown box. This past Saturday was my 2nd delivery from BrownBoxVeggies. I am their new biggest fan. 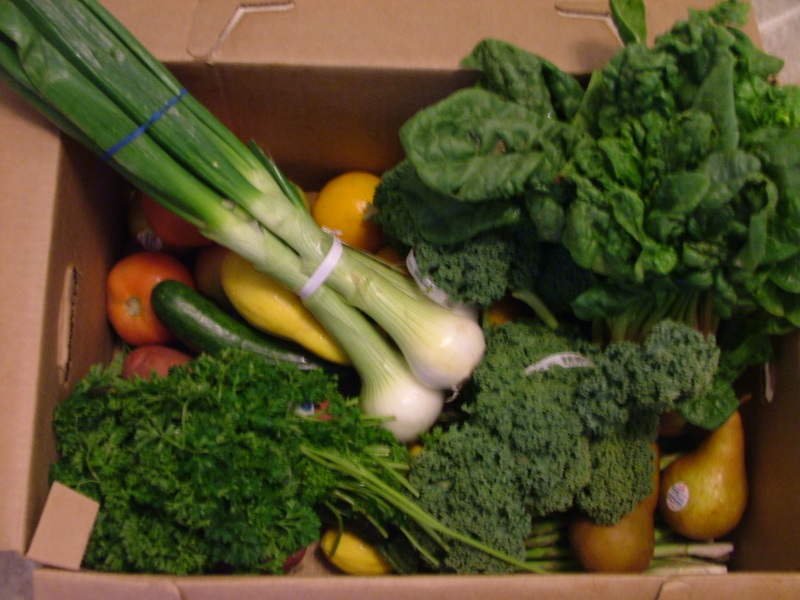 For those of you who are unfamiliar, the "Veggie Girls" stock up a big box of fruits and veggies to deliver on the 1st and 3rd Saturdays of the month. They reach out to as many local farms as possible to grab what's fresh and being harvested right now. Then, they pack the box FULL of what they've found and sell it to people like us for only $22! I couldn't duplicate what I received for $22 in a grocery store and the produce was fresher and didn't go bad on me before I could use it all. My first box was so beautiful, I almost cried when I opened it. Even my little one got excited helping me unpack. This box contained broccoli, parsley, tomatoes, spinach, kale, Carolina Sweet onions, squash, zucchini, pears, oranges, potatoes and asparagus. A true cornucopia. We used every bit of it with delight. So, this past Saturday was my 2nd go-round. Sorry that I didn't take a photo of Box #2...we dove in and never looked back! This time we received Carolina Sweets, cabbage, collards, oranges, grapefruit, tomatoes, radishes, Romaine, corn, strawberries, apples and dill. Lots and lots of dill. I'm talkin' about two humogous bunches each about 3" around and 12" long. My head is reeling trying to figure out what to do with all of it. This week might be the week I dive in and try to make my own pickles. But, first, dinner. Of course, when you think of dill, one of the first ideas you have is salmon. Since my daughter is eating salmon (happily) I'm cooking it every chance I get. I whipped up this dinner and we ate al Fresco on the patio. NOW, my title makes some sense, huh? 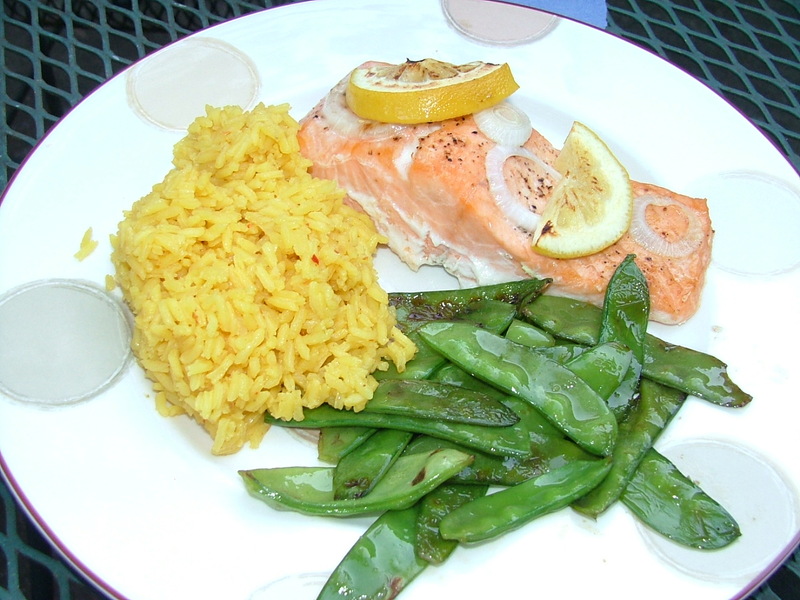 Salmon with dill sauce, sauteed pea pods, and yellow rice. Then, we just drizzled the sauce over our salmon and devoured it! I'm a sucker for anything pickled, so I think I'll actually add a few more capers next time. I have actually eaten capers out of the jar with a spoon before. (The first step is admitting it, right?) Thank you Veggie Girls for my jam packed boxes of loveliness. And, you may be the reason that I finally embark on this pickle making project. The idea of canning is a little intimidating, but I can't let all this dill go to waste! If any of you need some dill, I can hook you up. I've said this so many times, I should put it on a T-shirt. Pizza is the world's most perfect food: all food groups are deliciously represented all in one pie. Is it fattening? Yes, it can be. Is it healthy? Yes, it can be. Is it a most magnificent creation? Yes, it is. Thank you to my buddy The April Blake , who clued me in about the Uncle Maddio's premiere party that took place this past Friday. The restaurant is located in the Adesso building on the corner of Blossom & S. Main. Neil and the Vivver and I attended and had a great time. First, we met the owners, Ted & Marcia who are super nice people. We chatted with them and they gave us the rundown on how the restaurant works. It's such a cool concept: You proceed through a line to order your pizza. You choose your crust (traditional, whole wheat, or gluten-free) then choose your sauce (Tomato-Basil Sauce, Zesty BBQ, Buttermilk Ranch, Spicy Buffalo, Herb Pesto, Olive Oil). Then the real fun begins: so many meats, cheeses (mozzarella doesn't count, it's a given) and vegetables to list. So, you choose everything you want on your pie and the pizza maker constructs it right in front of you. From there, you order your drinks, and find a table. Their slogan is "Served with Love" and that's just what the nice man who delivered ours to the table said as he presented it to us. Uncle Maddio's also has some Signature pies to choose from if you're not in the mood to create your own masterpiece. The salad menu looks awesome too. I can't wait to try the chopped salad. And, there are paninis as well. Click here to see the menu. The pizza was, in a word, fantastic. Viv went with the all-time kid's classic "cheese." Neil ordered one of their signature pizzas, the "Steak & Blue," which is a heavenly creation consisting of olive oil, mozzarella, blue cheese crumbles, grilled angus steak, roma tomatoes, garlic, spinach, fresh basil and balsamic glaze. Tasty little side salad; croutons made of pizza dough! I opted to build my own which was eggplant, feta, olives and tomato. The three of us shared and tried all three. None of them disappointed at all. The crust is really crispy but not brittle and fragile. The toppings were all fresh and the pizzas just looked pretty, quite frankly. They serve 9" individual sizes, which I couldn't finish. They also have an incredible deal for kids: a 6" pizza made to their liking with a drink for $3.50. Those of you with kids know that the choices for children can leave a lot to be desired and they usually aren't a very good value. This way, the kids can have control of what goes on their pizza which is a great way to engage them and get them excited about their meal. Yum Yum, eat 'em up! Here's another detail that I think is noteworthy: The price of the pizza is the price of the pizza.They don't nickel and dime you with the old "per topping" additional charges. That's huge to me and it's little touches like this that win my loyalty. 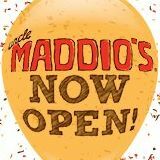 I am excited that Uncle Maddio's has come to Columbia. The USC students are going to be in hog heaven since they are right smack in the middle of campus. And I suspect everyone else in town who tries them out will love this restaurant as well. My family sure does! It's true. I'm a Southerner. I don't do cold well. But, I can survive what we call winter down here without too much complaining. However, I can't deal with wet cold. Wet cold is a whole 'nuther matter. This is the kind of cold that usually attacks your feet first and then you're screwed because it simply won't go away. Instead, it travels not UP your body but INTO your body. Like all the way in, into your bones. Then you're really, really screwed because even if the sun comes out and starts burning up the planet, that damn wet cold is already in your bones and it doesn't want to leave anytime soon. This is what I've been dealing with all flippin' day. 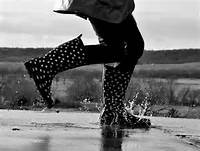 While rain is always welcome this time of year because it takes all the horrific pollen down the drain, today the rain decided to bring cold temperatures with it. Oh yeah, it looks cute until it attacks you. Spiky little SOBs. Here's a tip: get outta that damn field you dimwit! I mean, come on, really. It's past Easter, the dogwoods and azaleas are blooming, we're supposed to be well into our brief spring which will quickly segue into our blazing hot, "have I gone to Hell?" summer and here we are with 40's, rain and cold in our bones. So, despite the fact that it's April, I just had to fight fire with fire this evening. You guessed it. A big ol' pot of chili. If you're not in the habit of making chili, you should rethink that. It's not hard, you can add anything under the sun to it and it doesn't take long. And, I can tell you with complete authority that it WILL knock that chill out of your poor, freezing, chattering bones! Worked like a charm tonight. Oh, yeah. Warming up now! Brown the meat in a little olive oil and drain. In your stock pot, or Dutch oven, saute the onions, peppers and garlic until the onions start to soften up. Stir in chili powder, cumin, coriander, oregano, and salt and cook about 1 minute. Add tomatoes, ground beef and beef broth. Bring to a boil then lower heat, cover and simmer about 30 minutes. Add beans and heat through, about 5-10 minutes more. We like our chili with a variety of accompaniments. Sometimes with a dollop of sour cream, cheddar, chopped green onions, Fritos, avocado; whatever sounds good at the moment. 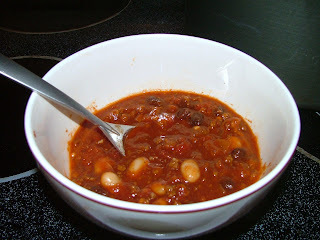 This pot of chili turned out awesome tonight and was just what the chilly doctor ordered. Stay warm this spring!